It’s coming up to Christmas, and that means only one thing for Taylors Wine – it’s time to crank up their competitive edge. B&T’s Marketing Team of the Year have created a summer campaign to get Aussies consuming their wine at the ideal temperature, and it’s not exactly what you’d expect. Clare Valley family winery Taylors Wines have crafted the ‘Taylors Temperature Challenge’, created by Taylors creative and strategy agency Mr Wolf, to educate consumers about chilling their reds and warming their whites to discover the benefits that perfect serving temperature makes. “We’ve found that a majority of consumers aren’t aware of the impact that temperature has on wine, but many experts agree, it is the single most important factor to ensure it is being served at its very best,” chief marketing officer Cameron Crowley said. To understand the significance of the problem, Taylors commissioned an IPSOS survey and found that 82 per cent of Australians are drinking their red wine at or above room temperature. Taylors then called on 27 of the leading food, drink and wine experts to understand the problem from an industry perspective. The survey found that while care and attention is taken to serve wine at the right temperature in bars and restaurants, this often isn’t considered when drinking wine at home, especially during warmer months. Over 90 per cent of the experts agreed that serving wine at the right temperature would not only improve the taste and aroma of wine, but lead to a greater appreciation of individual varietals. Taylors is making things easy with their innovative on-pack back labels featured on its Estate and Promised Land wines. These touch-activated sensors change colour depending on the temperature of the wine, and by referencing the temperature guide next to the sensor, wine drinkers can know exactly when their wine is at the right serving temperature. If consumers don’t have a bottle of Taylors Estate or Promised Land wine featuring the innovative optimum drinking temperature sensors, they are invited to register their interest through www.winetemperature.com.au to receive a free set of temperature sensitive stickers to use on any bottle of wine. “We still haven’t met anyone who doesn’t immediately go ‘that’s a great idea’ when you explain why we added the sensors to Taylors bottles. And everyone who’s tested it says it really makes a difference,” managing partner of Mr Wolf, Tony Singleton said. 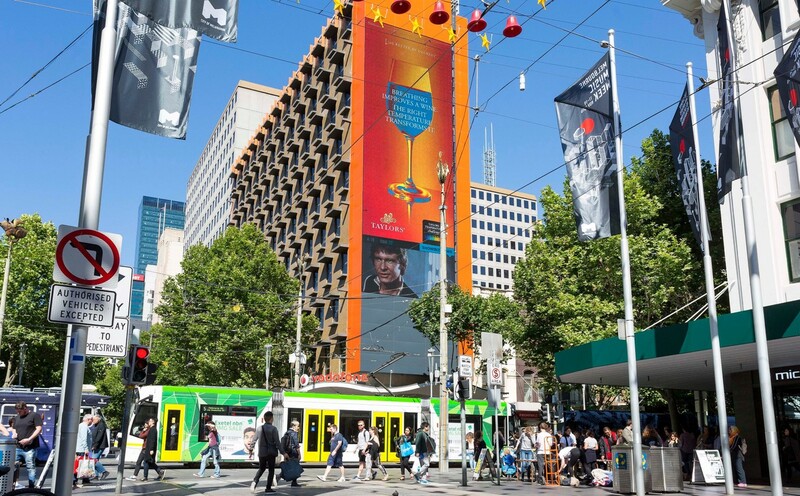 The campaign is heavily integrated across a mixture of channels, with a focus on contextually responsive large format digital outdoor displays in Sydney, Melbourne and Brisbane and the Executive Channel Network (across national CBD office buildings). Taylors will also amplify their message through radio with key partners Nova Entertainment and Macquarie Radio Network in the lead up to the entertaining season. The radio campaign will be integrated through digital with online giveaways and on-air tastings. There will be massive digital presence for the campaign through digital display, video pre-roll, social media and content seeding and amplification. Taylors will also engage digital influencers through the #tempchallenge hashtag, inspiring consumers to take the challenge for themselves. Eye-catching retail displays have been designed to bring the campaign to life in the in-store environment. Taylors first brought the temperature story to consumers in 2015 with a campaign that saw the small family winery be recognised for marketing team of the year by B&T Magazine and the Australian Marketing Institute, along with a trophy from the Effies in the beverage category. The campaign will continue throughout the summer drinking and entertaining season.